This is somewhat of a catch-all category for the collection, encompassing books, ephemera, magazines, diplomas, and so on. The very first object I formally accessioned and cataloged into the collection was a cypher booklet given to me for Christmas by my dear husband, Josh. And yet this is by far the smallest section of the collection, not a direction that I particularly focus on. .3-.5 are almost certainly older, suggested by more advanced acidic discoloration of the paper core, and the surface quality, which is flatter (dyed?) vs the more modern, glossy finish of .1 and .2. 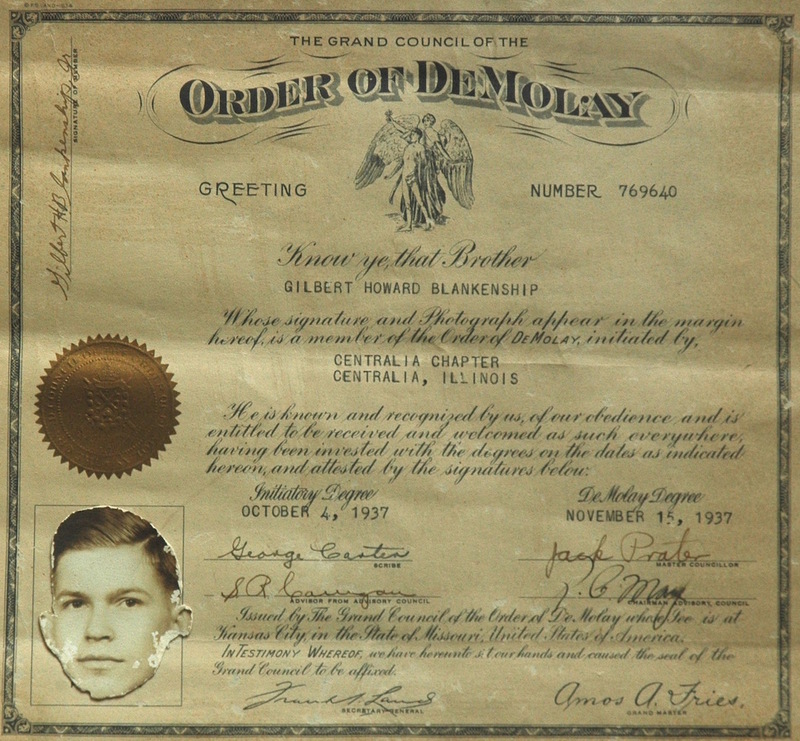 Order of DeMolay membership certificate for Gilbert Howard Blankenship Jr, issued by the Grand Council of the Order. 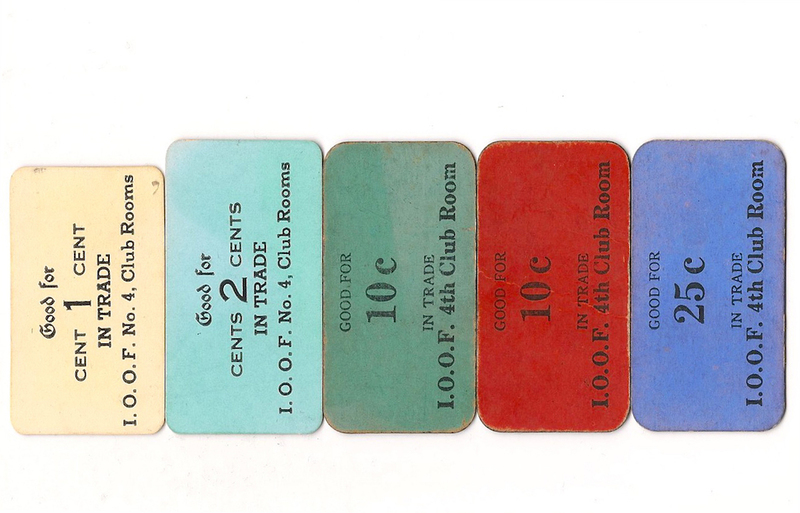 Reasonably standard membership document, numbered 769640, for a member of Centralia Chapter of Centralia, Illinois. His Initiatory Degree is noted on October 4, 1937; his DeMolay degree on November 15, 1937. At bottom are reproduced/printed signatures of Frank S Land (Secretary General) and Amos A Fries (Grand Master). Proper, hand-written signatures from the member’s Chapter include George Canten (Scribe); Jack Prater (Master Councilor); S.R. Ca[illegible] (Advisor a From Advisory Council); R.C. May (Chairman Advisory Council). The signature of the member is in upper dexter. Affixed dexter center is a metallic seal, which is embossed. Just below that is a cut-out photo of the member’s head, affixed within a printed box for the purpose. The photo is badly chewed up around its edges, and is threatening to delaminate from the document. Condition: Margins of the paper are extremely rough, lower inch across entire document is badly discolored, also along right edge. Paper is scuffed and worn overall, showing significant losses of the pulp overall when held up to light. Pinhole, UL. Photo adhesive is dried and may crack off, and photo itself is badly chewed at all edges, including notable losses around both cheeks. 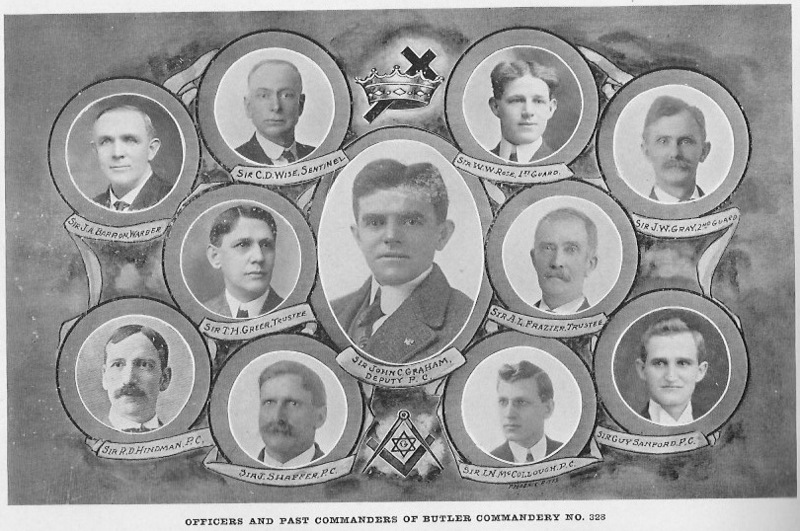 Grey card cover around 48pp of glossy paper printed by offset lithograph, for the Annual Convocation of the Grand Commandery of Pennsylvania, Ancient and Illustrious Order Knights of Malta, which took place May 14-16, 1912 in Butler, PA. The whole booklet is bound together by black, red, and orange-striped strings. Includes a history of the Borough and County of Butler, broadly illustrated with images of the town and its industries. Also a history of the local Commandery, with loads of portraits of officers, both singly and designed together as pages of vignettes. Several Masonic symbols, probably descended to the order via the Orange Order/Royal Black are peppered throughout, above and beyond the use of symbols common to the KT. Final two pages are reserved for hijinks of the Princes of Bagdad, the fez-wearing social order of the AIOKM, with seeming nonsense about “dog biscuits for all canines,” and to the Ladies: “We only ask that you KEEP MUM and don’t mention a Siesta 77, only to your own Prince after you are home. BE OBEDIENT!” As well as an edict to the “FRATERS” from the Illustrious Sultan. Small personal cipher booklet for a Masonic degree/order, the Order of the Essenes. Published by Redding & Co. Listed as an “exposé” in a list of such on Phoenixmasonry.org page. Consists of a very long and complex cipher for Lodge ritual, and includes 8 “Floor Charts” to map out processional rituals. 205 pages. Mounted inside a cloth cover with enclosing snap. A Christmas gift from Josh, Christmas 2008. Small personal cipher booklet for a Masonic degree/order. Consists of a very long and complex cipher for Lodge ritual, for the conferral of the three “ineffable” degrees. Familiar, but different. Cipher is pretty complex, more than just phonetics. Is this NY GL ritual? 252 pages. Mounted inside a cloth cover with enclosing snap. Also signed on front and back liners and on title page. 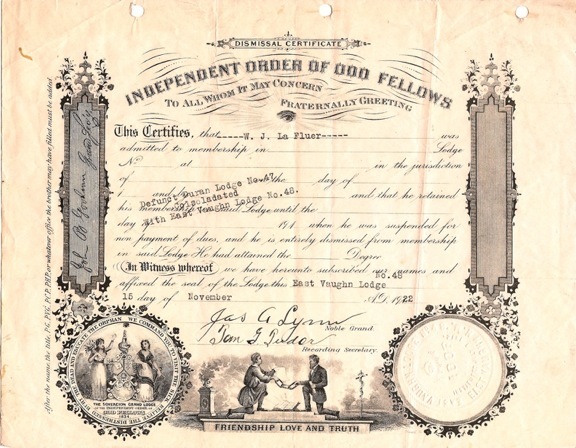 This is to certify that Bertram W. Anderson was adopted a member of Wyandoth (?) Tribe No. 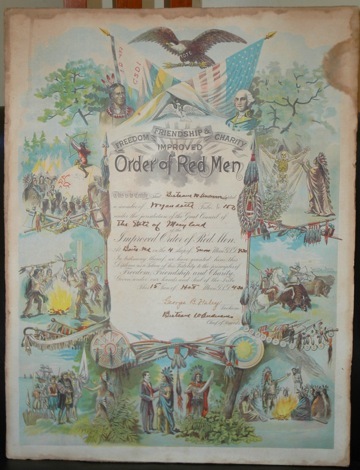 152 under the jurisdiction of the Great Council of The State of Maryland of the Improved Order of Red Men. At Bath (?). Md on the 4 sleep of Sun Moon G.S.D. 430. In testimony thereof, we have granted him this Diploma as Token of his Fidelity to the principles of Freedom, Friendship and Charity. Given under our hands and Seal of the Tribe This 15 Sun of Hat Moon G.S.D. 430. Odd that the man for whom the document is written, is also the signing Secretary. Probably means that at some point, this Tribe got the adoption certs in, and they back-issued to the members. and embossed with the seal of East Vaughn Lodge No.48, East Vaughn, N.M.
A small blue booklet, hardcover, 16pp including endpages. A ritual cypher for Knight so Pythias. The sections of the text are divided by large titles of RP, RE, RK & RK. I blurred the ritual text here on purpose. I know, it’s in cipher, so theoretically it’s still occluded, but I just didn’t feel right broadcasting someone’s ritual, regardless. Monitor that belonged to Lloyd Brooks Dodds. at Mystic Tie Lodge No. 398, Indianapolis, Indiana. Small, red leatherette covered ritual cypher booklet with hand-stitched & tied thread binding. Endpages are printed marble or crackle design paper. This was a gift from Don Viets & Kevin Blackerby for Christmas, 2009. A hand fan from the Moolah Shrine Temple Circus. Heavy card cut into the shape of a fez, with an undulating wood handle, the thickness of a tongue depressor, stapled to the fez. Recto is printed to look like a Shrine fez, and reads “Moolah Shrine Circus”. Verso carries an advertisement for Falstaff Brewing Corporation. There is an illustration of people barbecuing at the beach, below which are exhortations that “…it’s time for a BAR-B-Q ‘OUT’!” and for people to “…TRY these popular BAR-B-Q ‘OUT’ spots” [followed by a list of parks in and near St. Louis, MO], and to “TAKE ALONG AMERICA’S PREMIUM QUALITY BEER” with a Falstaff logo. Pamphlet advertising the Feb 21st, 1930 Formal Mid-Season’s Ball, at Della Robia Garden, Miami, FL. Booklet has dark teal-grey marble card cover and 8 interior cream colored pages. Inside are to be found a portrait of a man in Frogs fez (probably E.P. Landry, the club President), a list of the officers, the Club Motto: “Wholesome Recreation / A Pal of Happiness”, and Club Colors: “Orange and Green”. 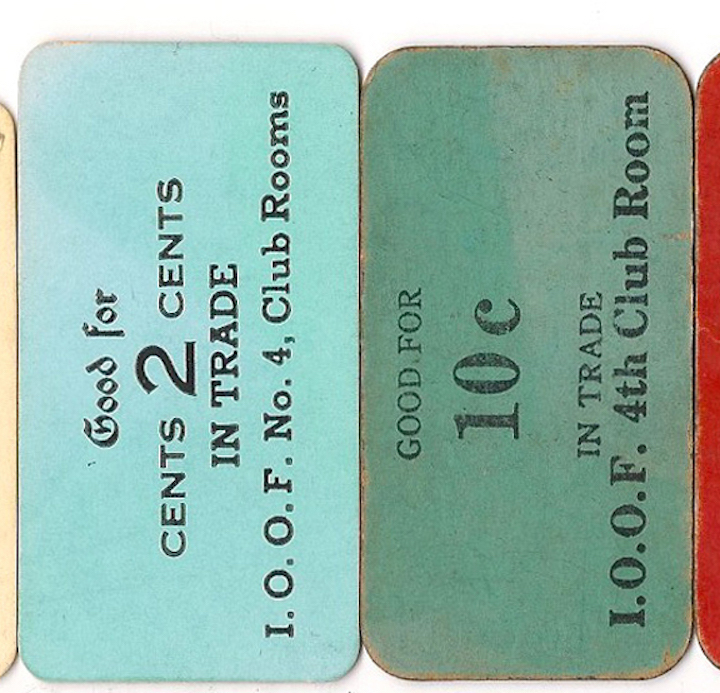 Centerfold is the formal invitation to the Ball, to be entertained by “Honey Boys Orchestra Entertaining, From Nine o’clock p.m. to 2 o’clock a.m.” and the cost (or, “subscription”) is listed as $1.00. On a later page is a group portrait of five men in tuxedoes, all wearing Frogs fezzes. The Frogs fez appears to have been dark, with an embroidered or bullioned frog emblem, above which reads “THE FROGS” & a year date, and below embroidered with the city, in this case, Miami, FL. Black leather folder (5.125 X 3.125) contains two documents, both pasted in, but separately, so that the smaller folds out once over the larger, which folds out in two directions to a much larger doc. The larger is his Master Mason Diploma, with the standard language in the center, surrounded by two columns topped with spheres, two ashlars (one rougher, one finished), an altar with a bible and square and compasses upon it, the entire scene strewn with working tools, including a lewis (which is not symbolically used in NM). The seal of the Grand Lodge is printed, lower left, and the embossed seal of Montezuma Lodge #1 of Santa Fe is just below it and overlapping. Larger doc is filled out in brown fountain pen to LaVern John Charles, dated 9th April 5918, and signed by Alpheus Keen (all in Keen’s hand). 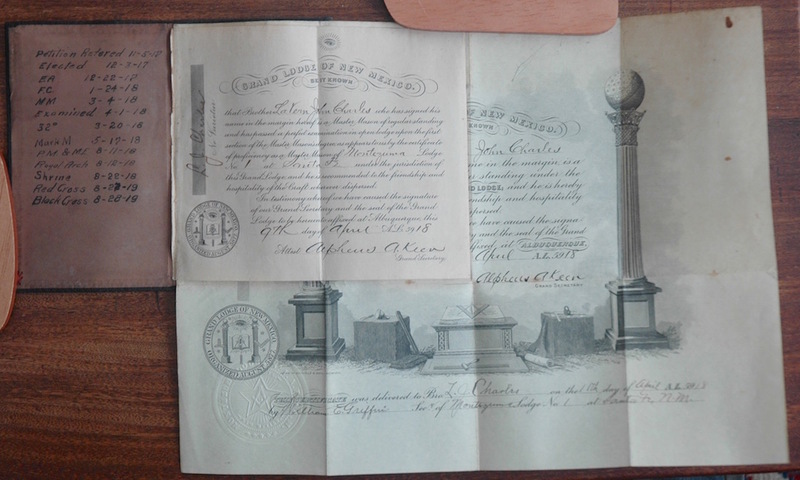 The smaller doc is a Master Mason certificate of proficiency, also dated 9th of April 5918 and signed by Alpheus Keen. Inside the cover of the folder, L.J. Charles has handwritten, in black pen, his Masonic dates. A letter on white typing paper stationery letterhead of the AASR Valley of Santa Fe, Harper S Cunningham SGIG. The letter is printed in purple carbon paper ink. It is a form letter addressed to Mr. Westy Peterson at Chloride, N. Mex. It invites Mr. Peterson to petition the Valley of Santa Fe, for the Reunion scheduled for the 23-25 May of the same year (1910). 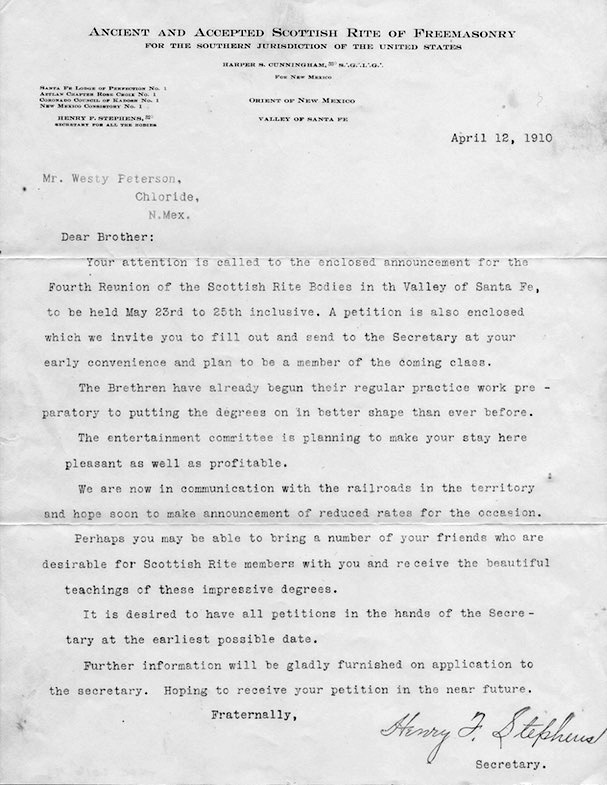 The letter goes on to say that reduced railroad rates were being secured, and entertainments planned for the Reunion. Dated April 12, 1910, and signed by Harry F Stephens, Secretary.